After you are satisfied with the overall cleanliness you can start to check other areas of your guitar. Tuning machines should be checked to make sure that they are still tight on the headstock. Usually there are small screws that mount each machine to the headstock. Check to see if they are tight as well as the bushings on the front of the headstock. 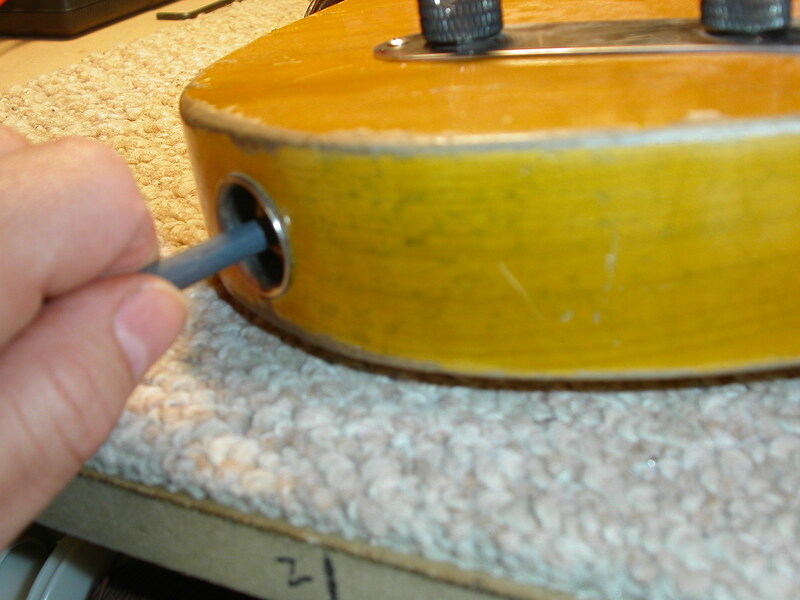 Some vintage or vintage reissue guitars have a pressed in bushing which needs no maintenance. Schaller, Grover, Sperzel and the like type machines have hex head bushings. You can tighten them if need be with a small adjustable wrench. Take a look at your string trees if your guitar model has them. Locking nuts should be inspected as well. Check that truss rod cover at this time if your guitar has one. Next let’s check out the bridge and tailpiece. On electric guitars check to make sure that all mounting screws are tight if you can get to them, if your guitars’ bridge mounts that way. Sometimes the mounting screws are under the saddles like a Stratocaster or Telecaster. Check all the saddle height and intonation screws to see of they are loose and possibly rattling. You can lose some tone and sustain if they are too loose. Archtop guitars with a complete wood bridge and acoustic guitars need just a visual check of the bridge. Also while we are in the area we should take a look at the tailpiece if your guitar has one. It should be secured to the guitars body and all mounting screws should be snug down. Vibrato tailpieces such as the Bigsby vibrato type can become sloppy feeling if the handle is loose. You can tighten it at this time if need be. Pickup height can move from aggressive playing styles. I like to set the distance of the pickups from the strings between 1/8″ to 3/16″ as a starting point. This measurement is taken with the strings un-fretted. Then I adjust them by ear from there for balance. Check this measurement to see where you’re at. You may want to get the measurements from you tech after your next set-up so you can check them periodically. Before we move on to the electronics of the guitar check your strap buttons or strap locks and if you have a bolt on neck check the neck mounting screws. Rarely does a neck mounting screw come loose but it does not hurt to check. Lastly the electronics should be checked to make sure there is no noise or loss of function. Sometimes potentiometers get dirty and sound scratchy. They can be cleaned out with contact cleaner. I like the Caig Deoxit. Just spray a small amount into the pot itself and turn, turn, turn about 10 times each way. Old style open switches can be lightly sprayed but be careful if you have a new completely enclosed switch. You do not want a pool of contact cleaner in there. ¼” Output jacks can be cleaned by rolling a small piece of #600 grit sandpaper about the size of a cigarette, “plugging” it into the jack and twisted around several times. On old vintage guitars heavy oxidation sometimes builds up and the guitar may not get a very good ground connection. I have actually seen a few vintage guitars with output jacks so badly oxidized that the guitar did not work at all! At this point if your guitar sounds great and is comfortable to play you can continue using it until such time that you feel you need it professionally set-up by your tech. These little maintenance tips can save you money and save your tech time at each set-up. Always take great care whenever you work on one of your instruments. Remember to take care of your instrument so it can take care of you.